· "Rise from your grave!" The text filter for downloading all photos does not work - fixed. Using the date filters to download more than 100 photos resulted in almost all the photos in the account being downloaded - fixed. Searching for a group that has a space in it's name - not fixed. Yeah, that last one is going to be a doozy. I'm not sure exactly what's going on in there but it appears to be a bug outside of my code. I have an idea for a workaround, though, so hopefully I'll find some time to code that up and release a new version soon. 19th-May-2008 12:38 pm - Has it really been that long??? So as of last Saturday, nerakyellek and I have been dating for five years (!!!). So to celebrate, we went down to San Diego, got ourselves a couples' massage at The Hidden Spa, went to a cafe in La Jolla to look for some Leonidas chocolates only to find that the cafe closed 30 minutes prior to our arrival, had dinner with her cousin Miki at a nice restaurant, and then finally concluding with _not_ going to the Jonathan Coulton show. Yeah... it was too hot that night and we were just feeling lazy so we decided to go back to Miki's place and hang out there instead. 21st-Apr-2008 03:43 am - I hate jetlag. Just got back from Japan. It's almost 4am local time and I'm wide awake. @_@ At least the cats are happy to have us back. Most. Distrubing. Teddy Bear. Ever. Automatically downloading the next largest size available if the one set in the preferences is not available. Expanding the troubleshooting section more to include situations I've been helping people with. Searching for photos via tags and maybe some other options. So with Photo Grabbr out the door, I can turn my attention back to a couple other projects that I have on the burner: rewriting Chemical Bonds and a remake of an old SNES game I started a long time ago (to be revealed once I get more of it done). My experiments in using Python for these projects didn't quite pan out (which makes me sad because I actually like Python...) so I'm back to using C++ for them now. Fortunately, I know a lot more about OpenGL and OpenAL than I did back then so things should go much smoother now. Lastly, I just got hold of the iPhone SDK so I may put things on hold for a bit while I play around with the SDK and see what cool things it can do. The latest thing that I'm working on that I'm about to release to the general public. 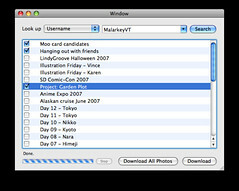 It's a utility for downloading photos from a Flickr account. Right now, I'm looking for some people to do some quick beta-testing (Mac OSX users only, though) so if you're interested, let me know. 24th-Feb-2008 09:45 pm - Congratulations, One2Swing Jitterbugs! Some friends of mine are on a dance team called the One2Swing Jitterbugs and they did a performance Saturday night at Kollaboration, an Asian talent show competition. I was lucky enough to be there and watch them take first place and $2000 in cash. Woot! Go see it! Karen got the books so that may or may not go to the top of the book reading pile (of which The Zombie Survival Handbook and Stephen Colbert's book are vying for the top position). Okay, really, next time I'll post about the cats. 12th-Jan-2008 11:01 am - "Rise from your grave!" Ah, LJ, it's been so long since I've updated you. My excuse is that I'm on a new project at work. Sadly, nothing that I can talk about but it's been busy, busy, busy as we put together a new application framework that this project and (hopefully) the next several will use. My part in this as one of the few Mac programmers in the office is ensuring cross-platform compatibility so I've been using a lot of open-source projects to do that (thank you open source software community!). The downside is that I've been doing so much interesting work that I haven't been able to work on my own projects :( Hopefully that'll change this month where I will force myself not to do office work on the weekends at home. I have a couple remakes that I've been itching to start on as well as a game that I want to wrap up and get out the door. Receiving games for my DS for Christmas didn't help matters much either. Target had a sale on Puzzle CrackQuest. I finally had to loan it to my friend just so I could stop playing it so much. Then disaster struck! I got The Legend of Zelda: Phantom Hourglass. So much for getting through my backlog of books to read. Next time: my cats and their obsessions. Mr. Do's Castle for cell phones. This page was loaded Apr 19th 2019, 5:22 am GMT.